There’s a fun little motif in “Teachers” that finds the characters of New Girl stumbling over their words, dropping whatever they’re holding, and running away. It only happens twice, so maybe it falls short of becoming a motif; its two instances, both in school-set flashbacks, qualify as a callback according to the 1970 Nakamura Sitcom Writer Accords. But it reflects the whole of “Teachers” nonetheless, an episode that catches the roommates as they flee, turning them right around in order to face their problems. In general, season four has found the leads projecting outward, only rarely turning inward to consider where the characters are in their lives. I get the feeling the show’s writers felt like season three was a little too insular, a little too focused on romances and conflicts involving the six leads and the six leads alone. There was a lot of amusement in that increasingly claustrophobic setup, but it did make New Girl’s world feel smaller than it actually is. To go too far in the opposite direction would risk isolating the characters we tune in to watch every week, but season four has done an elegant job of peppering in auxiliary players like Jess’ dad and Principal Foster, while introducing new faces like Sergeant Dorado and the titular character of “Julie Berkman’s Older Sister.” But the show has had another personality built for world-building under its nose (and under its roof) since the middle of the third season: Coach. From a practical standpoint, sending Coach offsite for the week also gives New Girl the chance to do a throwback Nick-Schmidt-Winston story, setting up a Guys’ Night that won’t be a typical Guys’ Night because these three weirdos are involved. True to expectations, Guys’ Night turns into another “Teachers” seminar, as Schmidt learns to do laundry, Winston learns how to “read a ruler,” and Nick learns how to love. It’s silly, but in that New Girl way that’s enriched by character and performance and the genuine affection the writers and actors have for these fictional people. 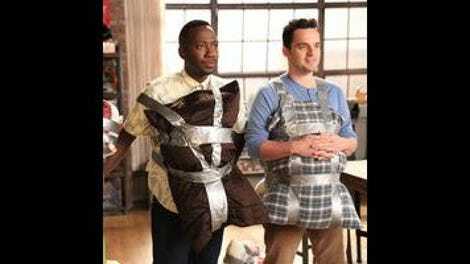 There’s only the lightest of mocking when Schmidt demonstrates his detergent deficiency—Jake Johnson, Max Greenfield, and Lamorne Morris are playing to extremes here, but there’s more honesty in how their characters interact while left alone than there is in a hundred chest-thumping portrayals of male bonding. 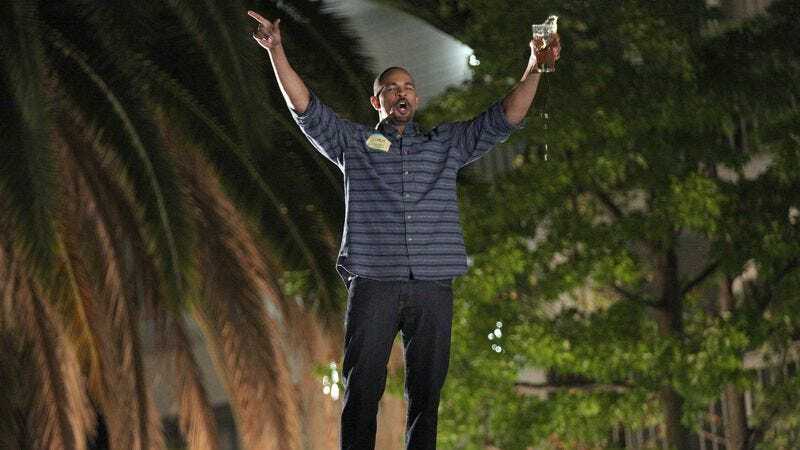 The guys’ shortcomings are narratively thin but thematically rich, and they make excellent fodder for the most amusing editing tricks of season four. It’s been a while since New Girl pulled out a montage (not since “Dice”? ), and “Teachers” has two of them, garnering laughs by mapping the low stakes of laundry duty and rudimentary measurement onto that old montage standby: The training sequence. Jess and Ryan’s whirlwind partnership at the conference is similarly a variation on a theme, a quick-cut “getting to know you” routine from a romantic comedy in which one of the partners wants nothing to do with romance. A sitcom has so many methods of telling a joke at its disposal, so it’s great to see New Girl still using those methods at this point in its run. It’s one thing for Nick, Schmidt, and Winston to build a tent and listen to Foreigner after Nick absentmindedly cops to being clueless about a basic human emotion. It’s an entirely different, much better thing to leap from Nick saying “What are we going to do, sit around all night and talk about love?” to the image of a blanket pup tent and the bittersweet tones of “I Want To Know What Love Is.” The late Sherwood Schwartz would tell you as much. Its characters might not always act this way, but New Girl is not the type of show to cut and run. It presents itself with a situation like guys’ night or Jess and Ryan’s forbidden romance and it goes for it, no apologies, with the energy of a well-paced montage and the comedic force of a good Gilligan cut. “Teachers” takes things a little slower, laying pipe for Jess’ new relationship instead of throwing the pair in bed together. (There’s still a kiss, though.) There are echoes of Nick-and-Jess in this beginning, like the off-limits nature of the coupling or the “Table 34” vibe of Brenda Brown’s symposium games, but “Teachers” carries it off with such pluck that those similarities are easily overlooked for now. (I mean, just look at Zooey Deschanel’s face after Julian Morris catches her at the end of the obstacle course. This show is still invested 100 percent in this stuff.) That’s just the show’s way, and I don’t suspect it will drop the Ryan plot and run away anytime soon. The new opening credits escaped my notice in the past two weeks, partially because the screener cut I saw of “Background Check” had the full, original New Girl intro, the first time I’d seen the entire sequence in months. I’m sad it’s gone, and its replacement seems like it’s merely a placeholder, but the old intro was hardly reflective of the show New Girl is today. (Not to mention that it was missing two characters.) Schmidt, Winston, and Nick aren’t the guys derisively scoffing at Jess’ eccentricities anymore—they’re the guys with their own eccentricities, doing their own singing from beneath twee scenery. I hope Coach’s teacher friends come back. They seem like fun. Ned can be reached via the popular email service Gmail—that’s pronounced like it’s spelled, “Guh-mail”—at therealned8@gmail.com.